Another weekend, another visit to one of Tokyo City’s various nature parks. This time we headed east to the Kasai Sealife Park, an aquarium on the edge of Tokyo Bay in what was once a seaside clam fishing village until industrialisation destroyed the fishery. Considerable work has gone in re-developing the area, which now has a large park, complete with the aquarium, giant ferris wheel and bird watching area. A short walk from Kasai Rinkai Kouen Station on the Keiyou/Musashino Line from Tokyo Station, the Sealife Park boasts an impressive three-story high tuna tank. A recent television feature talked about the Park’s goal of giving the Japanese the chance to learn more about the fish they love to eat so much. I won’t eat tuna (despite loving the way it tastes) because of the state of the fisheries, but it was amazing to see them swimming. They’re very impressive fish and the exhibit is very cool. Also impressive is the large penguin colony and the shark tank. Hammerhead sharks and what looked like mako share the tank with a massive school of sardines. I guess the sardines hate it, but it makes for an interesting exhibit! 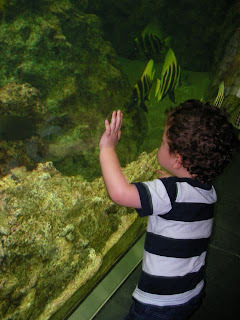 Isaac was very excited about the fish and managed to wriggle his way up to the glass to get a close up look, bellowing ‘fishies ippai look sakana!’ in his garbled Japanese/English, much to the bewilderment on many Japanese families! I enjoyed seeing the puffins too – such cute wee birds.